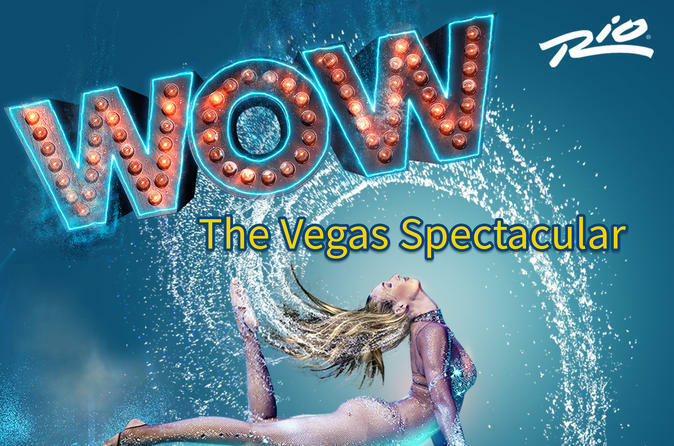 Prepare to be "wowed" at WOW - The Vegas Spectacular performing at the Rio All-Suites Hotel and Casino. With more than 30 artists fly, flip, fold, dance and defy the imagination in a 180-degree theater you'll definitely be left in awe! Make your way to the Rio All-Suites Hotel and Casino in Las Vegas on the day of your show at the showtime. Sit back as you are transported into a world of water, wonder, and fantasy at WOW - The Vegas Spectacular. Experience the internationally acclaimed production, seen by more than 2.5 million people, that transforms the ordinary into the extraordinary. More than 30 artists fly, flip, fold, dance, and defy the imagination in a 180-degree theatrical setting that engages the audience from beginning to end with 3D multi-media projections, water walls, and holograms. With the addition of breathtaking acrobatics, dazzling choreography, thrilling theatrical lighting, magnificent music and even finalists from America’s Got Talent, you will be wowed for sure. Why not make a night of it and purchase either the VIP Table or Booth Seating and you will receive a voucher for dinner at either El Burro Borracho or All American Bar and Grill. Special Offer - Book and save between 22% and 37% depending on seating category, compared to the local supplier's prices! - Book Now!